"Born with pearl eyes, the princess cannot see and will not speak. No tutor can unlock her voice until a mysterious tiger shows her the world in all its ferocious beauty. Neil Gaiman’s spellbinding tale is brought luminously life for the first time by Austin artist Divya Srinivasan." A talking tiger is the only one who may be able to get a princess to speak in this beautiful picture book set in a mythic India by the Newbery Medal-winning and New York Times bestselling author of American Gods and Norse Mythology, Neil Gaiman, and illustrated in bold colors by Divya Srinivasan. This stunning picture book will transport readers to another time and place and will delight parents and children alike. "Full of Gaiman's wit and whimsy, this one is great for reading aloud (and looks pretty lovely on the shelf as well). Gorgeous, with lush illustrations by Divya Srinivasan" (Brightly.com). 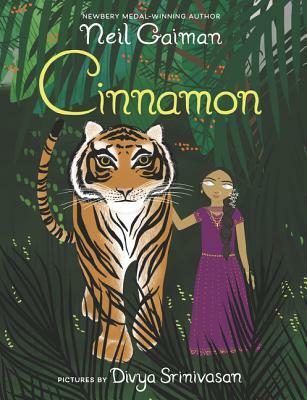 Previously available only as an audio book, Cinnamon has never been published in print before, and Divya Srinivasan’s lush artwork brings Neil Gaiman’s text to life. Divya Srinivasan lives in Austin, Texas. Her illustrations have appeared in the New Yorker magazine, and she has done work for This American Life, Sundance Channel, and “Weird Al” Yankovic, among others. Divya was also an animator on the film Waking Life. She is the illustrator of Neil Gaiman's Cinnamon and the author and illustrator of the picture books Little Owl’s Night, Little Owl’s Day, and Octopus Alone. More of Divya’s work can be seen at www.pupae.com.